SR 61 - High on performance! 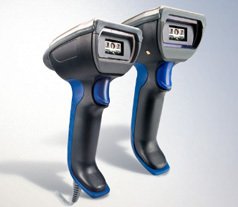 The Intermec SR61 handheld scanner family is built for rugged applications in diverse industries. With a high impact, virtually impenetrable housing and a solid state design, the SR61 exceeds industrial and military standards and can be counted on to perform well in harsh environments where dust, moisture or extreme temperatures are constants and operational uptime is critical. Best suited for: Warehouse, distribution and industrial manufacturing. Also supports proof of delivery and point of service applications. Designed to maximize uptime by withstanding extremer weather conditions. Can even decode poor quality or damaged symbols. Bright LED aimer makes targeting bar codes fast and efficient. Comfort grip and trigger location improve operator efficiency. Full speed USB 2.0 wired or Bluetooth® wireless interface for quick transfer to host system.